Journalist Trine Lejon at the Norwegian daily Vårt Land wrote a series about contemporary influential women in religion around the world. Trine interviewed two Sikh women for this project, Kaur Life founder Lakhpreet Kaur and Norwegian author and feminist, Harvir Kaur. 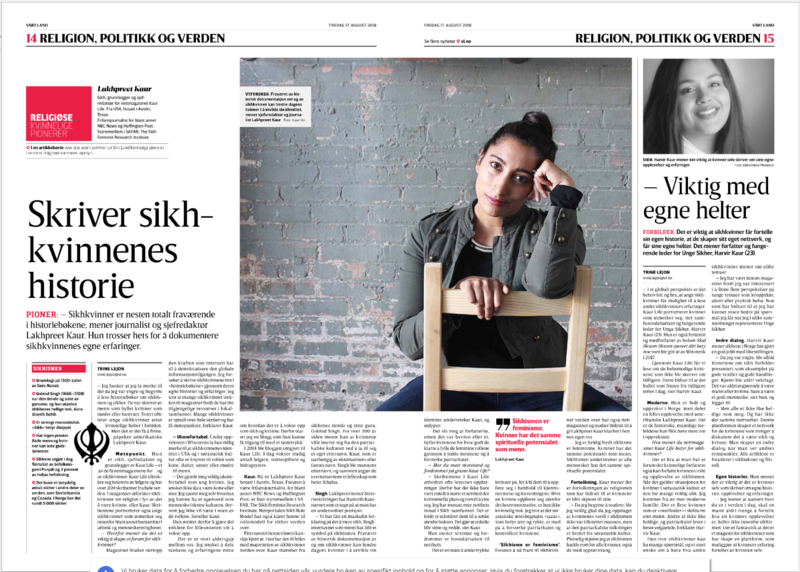 Below, and linked here, is the Norwegian article followed by the English interpretation done by Simran J. Kaur of Norway. You can read Lakhpreet’s original interview, given in English here. “Sikh women are almost totally absent in the history books,” said journalist and chief editor Lakhpreet Kaur. She is one of the few in the world who chases on the female heroes and who thinks hot to document the Sikh women’s own experiences. “I remember growing up and reading books about Sikh history. The books were written by men, and they only wrote about women as mothers and housewives. Very often, young Sikh women are looking for female heroes of the past. But there is little to be found,” says American writer, Lakhpreet Kaur..
She is a Sikh, a woman, and the editor of Kaur Life- one of the few internet magazines for and by Sikh women. Kaur Life attracts thousands of followers and has over 200 writers from around the world. In the magazine Lakhpreet explores her religion in light of being a woman, or Kaur. She also showcases young Sikh women who are excel in humanitarian and human rights. Why is it important to have a forum for Sikh girls? The magazine uses the power of the internet to write about the high-achieving Sikh women. I try to write about Sikh women in the history books, by sharing their own stories and experiences. I think many Sikh women are driven towards magazines because they don’t have many sources to go to in their local community. Many Sikh women are living across the world and have very few meeting points. Kaur means that everyone is the same. No one is superior no one is better than any other. Lakhpreet thinks that the name Kaur has been misunderstood, and that the male last name Singh has lead to a masculine understanding of Sikhism. The non-present history of Sikh women have lead to a much difficult way for Sikh women to have their own identity and to create themselves. Have you faced any critics regarding the Kaur Life? “It is important that Sikh women tell their own story, create their own network, and that they get their own heroes,” says author and acting leader of Young Sikher, Harvir Kaur (23). 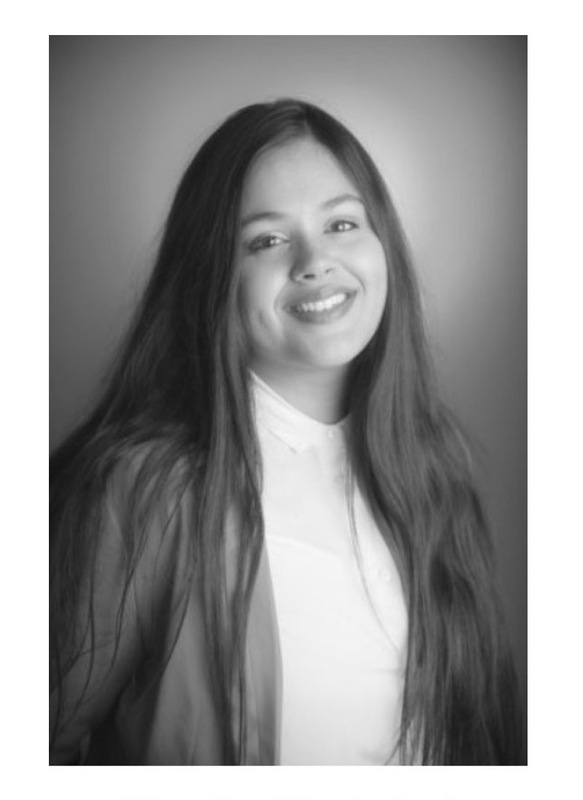 “Kaur Life portrays women who are distinguished,” says social debate and acting leader of Young Sikher, Harvir Kaur, 23, who is also feminist and author. “Through Kaur Life, we can read about the heroic women who were not previously written. This contributes to the fact that the gap existing from earlier times is sealed today,” says Harvir Kaur. Harvir Kaur was born and raised in Norway, but has similar same thoughts to Lakhpreet; she’s only heard about Sikh men in historical stories. What do you think about Kaur Life? Harvir thinks that Sikh women may have many questions. What inspired you to start Kaur life? I have a sister who is much younger than me so, when I started college she was just starting middle school. At the time, our relationship was mostly based on humor and we didn’t talk about deep thing that often but, I still wanted to share with her my thoughts on Sikhi and growing up. My solution was to start a blog, Kaur Thoughts, to capture some of the lessons I learned. That way if and when she wanted to access it, it would always be there for her, at her fingertips. The blog also turned out to be a wonderful way for me to clarify my own Sikh briefs and become articulate in my thoughts. Over time, I realized that Sikh women across the world were visiting the site so, in 2014, I formalized it into a non-profit, online magazine called Kaur Life. I think so many women were drawn to Kaur Life was due to a lack of resources for women exploring Sikhism, and Kaur Life fills that gap. Furthermore, many Sikh women are geographically spread out so there are few opportunities to gather in community; Kaur Life serves as a virtual community. What is the most important mission with this non-profit? The most important mission for Kaur Life is to provide Kaurs (Sikh Women) a platform to express their thoughts and to provide Kaurs resources to guide them on their Sikh journey. Why is it important to you to create and cultivate a space where other Kaurs can share their stories and ideas? Historically, Sikh women’s voices and experiences are absent from historical documents. Authors (who are mostly male) predominately address the Sikh masculine experience while ignoring female experiences. “Singh” (the name Sikh men share) becomes conflated with “Sikh,” and “Kaur” is portrayed as a subordinate role, if at all. This gap can lead to Kaurs internalizing the social oppression of being “the other.” Furthermore, the lack of historical documentation of the Kaur can hinder the identity development of a Kaur when compared to her Singh counterpart. Kaur Life, attempts to fill in this literary gap by providing a platform for Sikh women’s voices. As a response to a lack of Kaur-specific material, Kaur Life is infused with Sikh scripture and tailored to young Kaurs who have grown up in the West. Kaur Life hopes to be a space where Kaurs can express their ideas, share stories, and learn more about their Sikh culture to empower themselves. Kaur Life harnesses the power of the internet to democratize access to information at a global level. Furthermore, the vision of Kaur Life, of many Kaurs sharing stories, is inherent to the structure of the internet where many writers generate content for many readers. It is not a one-to-many model (like traditional media), but a many-to-many model. In this way, Kaur Life can capture a more diverse, holistic, nuanced, and representative view of the Sikh women’s experiences. Kaur Life is an attempt to finally start to document Sikh women’s stories and experiences in a systematic way. How have you seen Kaur Life grow (new numbers) and how do you hope to see it continue to grow? Kaur Life is primarily user-run, meaning that the public and Kaur Life readers submit content to be published on the website. It has been heartwarming and a wonderful to see the number of contributors, readers, and supporters grow over time. I hope this trend continues. Do you define yourself as a feminist? What is a feminist/feminism to you? In my opinion “feminist” is a tricky term because each person has their own definition. Additionally, the media and pop culture has muddled it’s true meaning. I gravitate towards Bell Hooks’ definition of feminism: feminism is a movement to end sexism, sexist exploitation, and oppression. Feminist politics aims to challenge and change patriarchy. In this light, I am a feminist. I feel very lucky that Sikhism is inherently feminist (see this article for more info on that) and the Gurus (prophets) worked to dismantle unjust power structures and create a people who were ideally striving for a more just and compassionate world where every single person could have an environment to reach their full potential. On Sikh Love Stories you say that “Sikh women’s voices, stories, and experiences are often left out of the historical and contemporary narratives of the Sikh experience. When women are mentioned, they are often identified by their relation to me, as wives, daughters, sisters or mothers to a male, but their unique voice and perspective is ignored” Can you explain a bit more about this. Is it US or all over the world? When did you first notice this? I have noticed this is in South Asian and American culture. I’m not sure when I noticed this but I remember reading Sikh history books that would only praise women for their exceptional roles as wives or mothers. History is notorious for neglecting the female experience. Often times, young Kaurs page through Sikh history books thirsty to read about Kaur heroes of the past, but sadly they are only given a few meager lines to read. This gap is due to the fact that history was predominately written by men. Men who perhaps (not always) viewed women to be unimportant to the human narrative. In the past, men exclusively occupied the “public” or “political” spheres of life, whereas women exclusively occupied the “private” or “domestic” spheres of life and thus men may have felt that women did not contribute to important events. So, authors ignored them when writing history. This refrain made me very uncomfortable because at the time, I wanted to be neither wife nor mother. It made me wonder, “How could I have value as a person in the South Asian community if I didn’t want any of these roles?” It also signaled to me that these authors (whether intentionally or not) were praising these women partly because of how well they performed femininity, how well they supported men, and how well were able to reinforce patriarchy. Through more reading and learning, I was happy to realize that valuing women because of their relation to men was not a Sikh belief but rather a South Asian belief. I quickly came to see that all women, including rebellious women, were considered worthy through the Sikh lens. (See this article for more on that.) There are several Sikh leaders and authors (both men and women) today who explore the egalitarian and social justice nature of Sikhism. Women have the same potential as men? Yes; Sikhism asserts that all people have the same spiritual potential. Have you met prejudice from you community or people doing your project? What are the reactions? Why do you think that is? While I have received a tremendous amount of wonderful support for running Kaur Life, unfortunately I have also been subject to a lot of cyber-bullying from within the Sikh community. I think there are three reasons for this. First, the nature of the internet makes it easy for people to bully without recognize its effects. Being anonymous, not being face to face with their target, and being able to immediately deliver thoughts makes the internet a perfect breeding ground for cyber-bullying. Second, it seems like sexism and misogyny (held by both men and women) fuels a lot of this bullying. Bullying a way to keep women in line and have them behave in accordance with gender norms and expectations. For instance if a woman behaves outside of heteronormative, cis, feminine expectations, she may be chastised for being unladylike, or inappropriate. I also think the South Asian concept izzat (or honor) has a lot to do with how women are policed. Such bullying are all ways to control women and reinforce the patriarchy. Lastly, when someone’s paradigms are challenged, they may become defensive. Re-thinking your world view can be uncomfortable and one’s initial reaction may not be positive. Kaur Life writers often push people to think beyond the status quo and work to have a more just, equitable world. This can include dismantling current institutions which will inevitably make people angry or uneasy causing them to lash out. Are there any specific topic that Sikh women are concerned or focused on, that is a global phenomenon? While I’m not certain, it seems like a lot of Sikh women wish to be seen and treated as equals in religious spaces; we wish to work towards and live in an equal society that our Gurus worked for and scriptures outline; we wish to eliminate the disconnect between belief (of equality) and practice (of inequality).